Fundamentalists object to infant baptism and criticize the practice primarily for two reasons. Unlike the Catholic Church, which accepts baptism as a sacrament that confers God’s saving grace, Fundamentalists view baptism as an ordinance, a public proclamation of one’s belief in Jesus Christ and the gospel. They claim God cannot confer his grace upon those who do not profess belief, therefore infant baptism is wrong because infants—since they are below the age of reason—cannot express belief. The individual Christian must first attain the age of reason and accept Jesus Christ into his/her heart as personal Lord and Savior prior to baptism. These “Bible Christians” will sometimes cite Mark 16:16 as a proof text: “He who believes and is baptized will be saved; but he who does not believe will be condemned.” They will say, “See, this proves that one must first believe. Since infants below the age of reason are incapable of belief it is not acceptable to baptize them.” But such thinking places an undue restriction upon God and is not only unbiblical but also unhistorical. 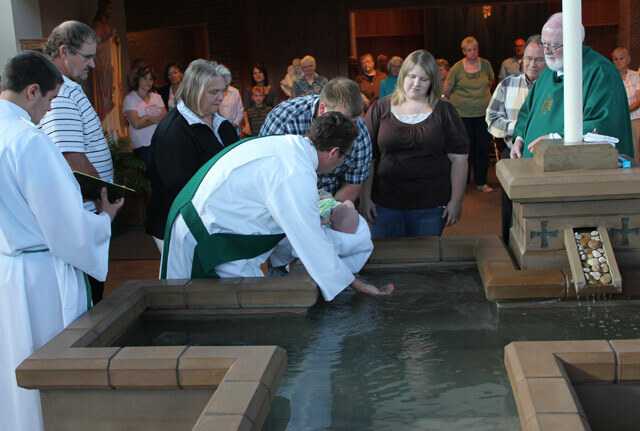 Infants are baptized on the faith of the Church as expressed by their parents. Whether or not one is below the age of reason and capable or incapable of belief is not the issue. Fundamentalists seem to miss this point. The issue is, “Can God confer his grace upon an individual based on the faith of another?” The answer is a resounding “Yes.” The Bible is filled with examples of this. Here we see the servant healed based on the faith of the centurion. But not only that, the text also tells us that Jesus “marveled” at the faith of the Roman soldier. Would he not also approve of the faith of parents who have their infants baptized? Notice in the narrative that Jesus healed the paralytic when he saw “their” faith, that is, the faith of those who brought the paralytic to him. As the episode is presented in the text, the grace of God’s healing power descends upon the paralytic based on the faith of others. The Fundamentalist claim that infant baptism is wrong because infants below the age of reason are incapable of a profession of faith falls apart with the preceding verses. Certainly twelve-year-old adolescents are mature enough to profess their own faith when they are alive but not when they are dead. Obviously Jesus raised Jairus’s daughter from the dead based upon the faith of her parents, just as God confers his grace upon infants based on the faith of the parents. Once again we witness the grace of God working based upon the faith of another. Unquestionably a demoniac would not make a profession of faith, yet Jesus heals the demoniac based upon the faith of his father. We have just seen four instances of the grace of God in action based upon the faith of others, yet Fundamentalists claim the grace of God cannot work in infants because it depends on the faith of others. Though the Bible records no instances of infant baptism, neither does it condemn the practice or instruct that baptism is to be reserved for adults only. Furthermore, infant baptism can be implicitly found in the Bible. Let’s look at the Bible’s record of the baptisms of three different families. Acts 16:33 records the baptism of the jailer and his entire family by Paul. Acts 16:14–15 records the baptism of Lydia along with her household. And 1 Corinthians 1:16 records the baptism of the household of Stephanas. Collectively, even though these passages do not explicitly indicate the baptism of children, they all imply the practice. Of course, it is possible for a household to be childless. However, the possibility of that all three households were is remote. Fundamentalists who object to infant baptism must interpret these verses with the assumption that each family had no children. If infant circumcision was appropriate for entrance into the Old Covenant, infant baptism is now appropriate for entrance into the New Covenant. Finally, in Peter’s speech to the crowd at Pentecost in Acts 2:37–39 he tells the people to “repent and be baptized, every one of you” and “the promise is made to you and to your children.” “Now when they heard this they were cut to the heart, and said to Peter and the rest of the apostles, ‘Brethren, what shall we do?’ And Peter said to them, ‘Repent, and be baptized every one of you in the name of Jesus Christ for the forgiveness of your sins; and you shall receive the gift of the Holy Spirit. For the promise is to you and to your children and to all that are far off, every one whom the Lord our God calls to him.’” Then verse 41 tells us that about three thousand were added that day. It is not logical to assume that this multitude of three thousand consisted of only adults. After all, Peter specifically instructs them that the promise is for them and their children. From such testimony it is clear that from its earliest centuries the Catholic Church has administered the sacrament of baptism to infants based on the faith of the parents and the entire Body of Christ. Certainly Fundamentalists would not deny medical care to an infant simply because the infant is below the age of reason and incapable of deciding for itself whether or not such care is pertinent. They would put their faith in a physician to administer whatever care is necessary for the well being of their baby. Yet they will not ask God to administer his grace to their child based upon their own faith. As Christians we need to ask ourselves: What is more important—the physical and temporal or the spiritual and eternal? Is baptism in a Catholic Church always by sprinkling? Is it ever by immersion? What of infants who die without having been baptized? If by sprinkling you mean gently pouring over the forehead, it was that way for the longest time. But lots of new parishes have full sized "pools" you can get into. As for babies who die, the Church has never defined a dogma on that, so a Catholic is free to believe as he wills, as long as its not something whacky like they go to Dollywood. I am sure, though, that they go to heaven. Last edited by CatholicCrusader : 12-04-2016 at 01:38 PM. Is Immersion Necessary for a Valid Baptism? I agree.... .....if I am reading it correctly.